I have been feeling travel weary as we approach our one year anniversary of leaving Australia and I must admit that I was regretting my decision to book a trip to the Gili Islands. 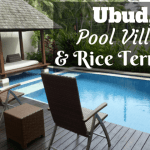 I was tired and just wasn’t in the mood for leaving our comfortable pool villa in Bali. I figured I had been to a zillion places around the world that sounded much like the Gili Islands and I didn’t really see the point of taking us all there. I am so glad I already had the booking. The Gili Islands are awesome! Although they certainly share characteristics with many tropical islands around the world, they definitely have their own unique flavour and one that resonated with us immediately. They are beautiful, there are clean beaches (all too rare in Asia), great diving and snorkeling, no motorised vehicles, a great vibe, great food and a million other reasons to love these islands. Below is our guide to what to do in Gili Trawangan and the other Gili Islands (Gili Air and Gili Meno), as well as lots of practical information about how to get to the Gili Islands, the ferry from Bali to the Gili Islands, the ferry from Lombok to the Gili Islands, how to get around once you are there and where to stay. 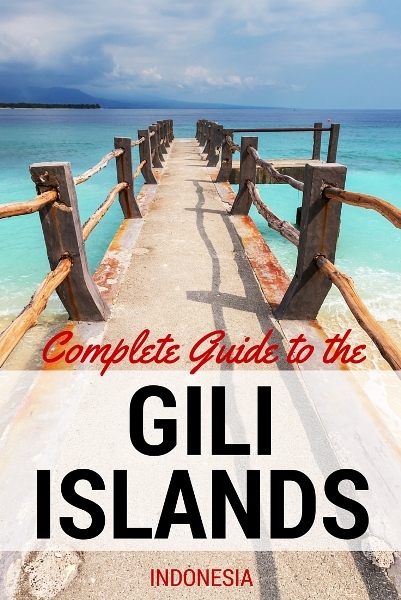 But before I start, here is quick intro to the Gili Islands. The Gili Islands sit just off the North West coast of Lombok meaning they are inbetween Bali and Lombok (although far closer to Lombok). 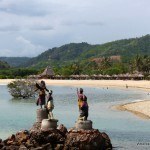 There are three islands – Gili Air, Gili Meno and Gili Trawangan (in order of distance from Lombok – Gili Air is closest). The islands are all close together, but you will need to catch a boat to get to them. 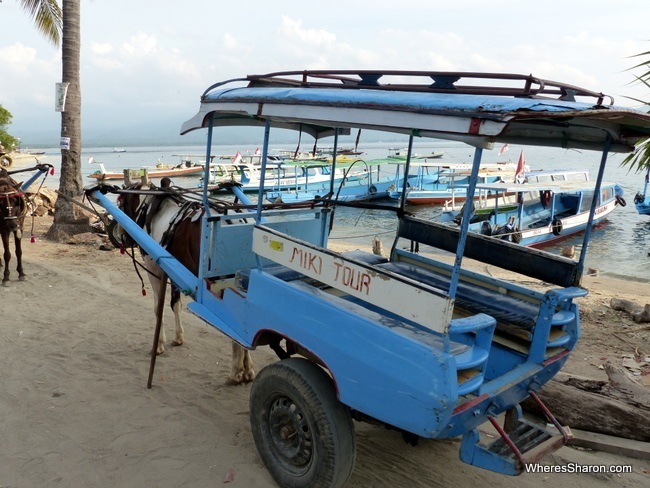 There are no airports and the only way to get to the Gili Islands and between them is by sea. Gili Trawangan is the biggest and most popular of the islands. If you want action, this is where to go. Gili Meno is the least populated and least busy island. This is the place to go to escape. Gili Air is somewhere in the middle. 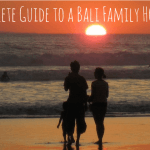 I read it is more popular with families but I probably saw more families on Gili Trawangan. Any of the islands is a great place to take kids. There is far more information about each of these islands below. This is our complete list of what to do in the Gili Islands covering everything we could think of particularly Gili Trawangan things to do. If you are like us and visit Gili Trawangan from one of the neighbouring islands, you are in for a shock! It is so much busier than the other islands and the first things we noticed were the busy lanes, big party signs and tons of restaurants and shops – even fully enclosed shops! This is not to say it is bad, not at all. We very much enjoyed soaking up the buzz and atmosphere that comes with more people. 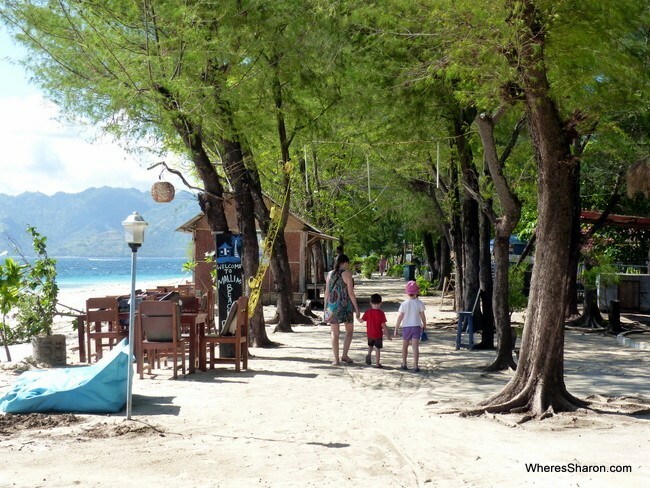 That is why our first suggestion for what to do on Gili Trawangan is just to walk around and soak it all in. Stop and have a drink at one of the many bars and restaurants lining the pretty beaches, have a gelato or a massage and just enjoy. One of the most popular (maybe most popular?) things to do on Gili Trawangan is to party. There are signs and bars everywhere including for special party cruises. The island is packed full of young people and I am sure it is lots of fun. Unfortunately, I can’t speak from experience. Being pregnant with two little kids, this was the last thing I felt like doing. However, in my twenties, I would have loved it. If it’s your thing, there are plenty of places advertising mushrooms. It is not hidden at all. There is a fast right reef break off the southern coast of Gili Trawangan. 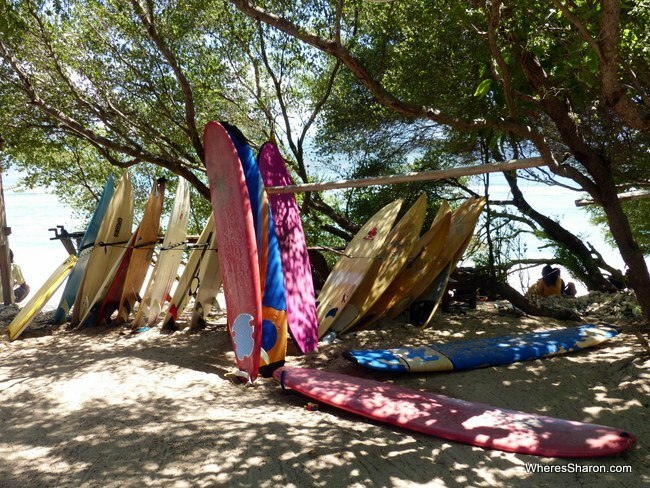 You can rent surf boards at Surf Bar opposite the break by the hour or day. 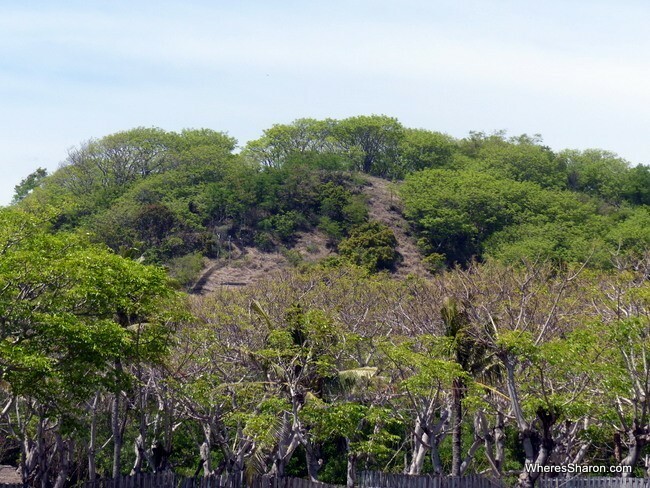 There is a small hill on the southern part of Gili Trawangan which is meant to give great views to the rest of the Gili Islands, Lombok and Bali. Unfortunately, we had trouble finding the path to walk up here! We can tell you that it doesn’t appear to be on the beach road! One of the best things to do on Gili Trawangan is to eat at the night market. It starts about 6pm and is the best option for eating on a budget with lots of choices and great prices. For a different option of things to do at Gili Trawangan, you can watch a stick fight. This is a traditional form of combat between two people and is often accompanied by music. The two fighters have a stick and shield. 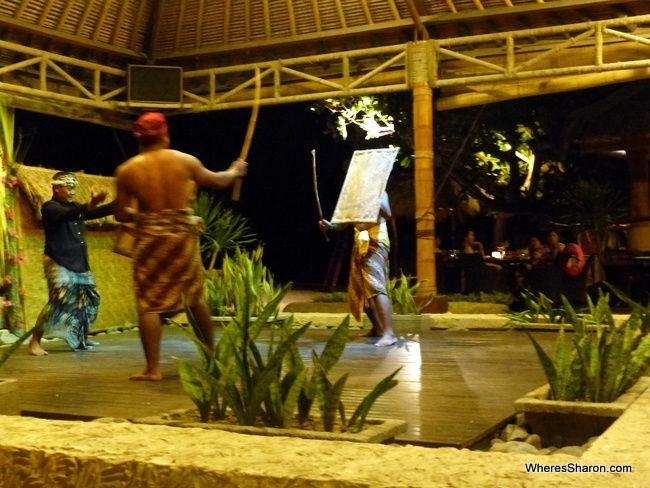 We went to a performance on Lombok and found it interesting. It is supposed to occur on Gili Trawangan on Sunday afternoons at the marketplace. Gili Meno is the smallest of the Gili Islands and has a quieter, more laid back feel compared to the others. There’s still all of the things you’d want or need for a stay, they’re just a bit smaller and fewer in number than on the other two islands. All this makes Gili Meno a generally tranquil and chilled place with no bustle and few people. The pace is slow and relaxed and Gili Meno is a great place if you want somewhere with not much to do not except swim, play on the beach and relax (with or without kids). 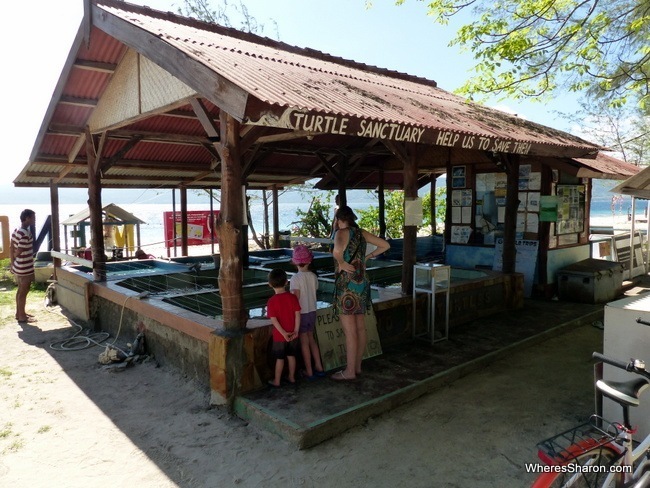 Near the southern tip of Gili Meno is the simple but charming Turtle Sanctuary. The sanctuary is the result of the hard work of Bongal, the sanctuary’s keeper, who wanted to preserve the turtle population of the islands. The sanctuary consists of six small pens holding baby turtles. Bongal finds eggs that need fostering, hatches them and then raises the turtles till they are eight months old and then releases them. You cannot touch the turtles but you can get very close to them. The kids liked seeing all these turtles up close, watching them play, feed and climb all over each other. Visiting the sanctuary is free however donations, which keep the sanctuary running and the turtles fed, are appreciated. He only needs 100,000 rupiah a day (about AUD$10) to keep them fed and I’m confident every rupiah helps support Bongal and his turtles. Another things to do in the Gili Islands is to snorkel off the coast of Gili Meno, near the turtle sanctuary and see turtles swimming in the sea. Although we didn’t do this ourselves, you apparently do not need to go very far from shore to see some. It’s not uncommon to see a large number of turtles at any one time. Like many of the beaches skirting the Gili Islands, there’s lots of dead and broken coral on the sandy bottom. This can make walking barefoot uncomfortable if not painful. 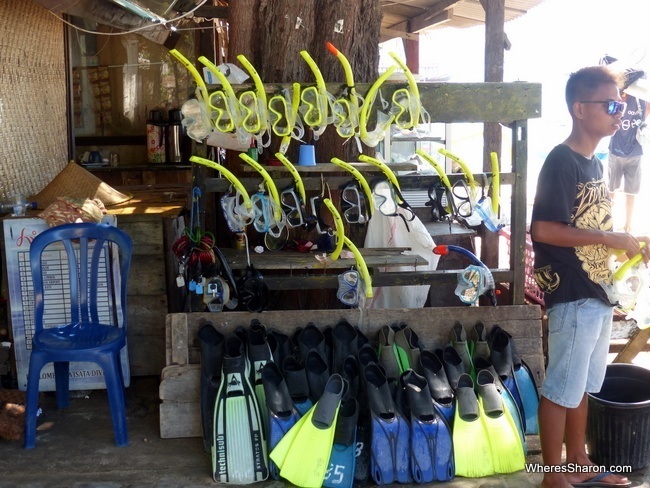 Snorkels can be hired at various places on the island. 50,000 IDR seemed to be a common price. One of our kids favourite things to do on the Gili Islands was this small bird park, tucked away toward the centre of the island, at the back of a small backpackers/lodge (the entrance is large but easy to miss). 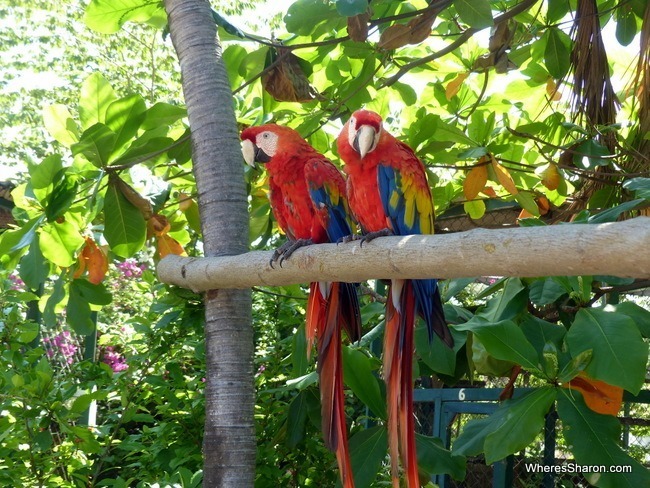 Although not huge this park has a good range of colourful tropical birds that you can get pretty close to, and in some cases touch. We had the park to ourselves during our visit. The park’s manager/guide was very helpful in pointing out the different birds, explaining a little about them and luring out the park’s crocodile from their sleep. We got around the park in a leisurely half an hour which was enough to see everything. The kids liked some birds more than others (they loved the cockatoo who mimicked what they said) but overall they and we had a good time. It was certainly worth the effort. If there’s a negative to this place it is that some of the birds were in cages too small for their energy levels and sizes. The sea eagles in particular seemed to resent their confinement. We’ve seen much worse on our travels and to the park’s credit it is building a new eagle enclosure but this is no aviary. Entry cost 50,000 IDR per adult and the kids – at 3 and 5 – were free (not sure at what age you’d have to pay). 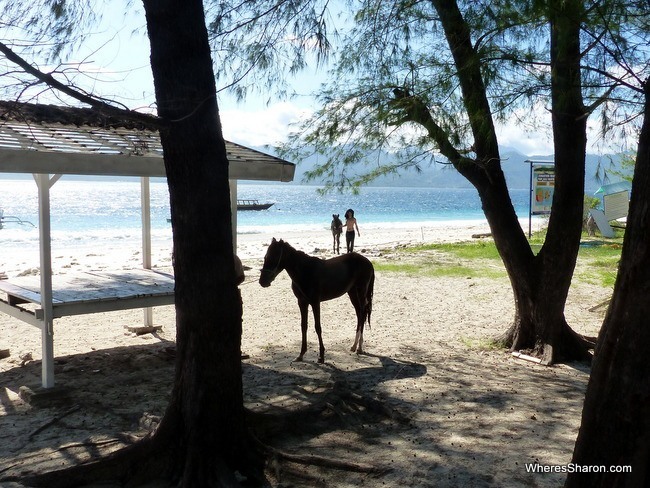 Another available activity on this island is to go for a horse ride. If you want to do this, it was not hard to find people offering the service as we walked south from the main jetty. Gili Air sits in the middle of the spectrum in regards to activity and people in the Gili Islands. 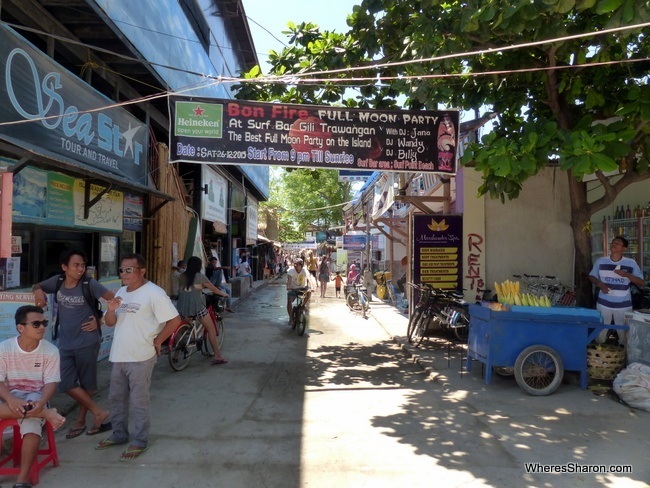 There are plenty of restaurants and people, but nowhere near the activity of Gili Trawangan. It takes about 90 minutes to walk around this island – there is quite a contrast between the different sides. I warn you though, it is hard going in the heat without much shade in many sections and most the time the air was very still when we visited. The beach here is awesome – there is beautiful soft sand, pretty water and plenty of places to lounge nearby for great prices. I spent one work day sitting in a lounge chair right by the beach here writing about the Gili Islands while the rest of the family played. Just perfect! Just near the dock on Gili Air you can attend a cooking class at Gili Cooking School. Classes last a few hours and there are three different menus that you can pick from. You cook the food and then enjoy a feast! Classes start from 275,000 rupiah. They have an informative website here. 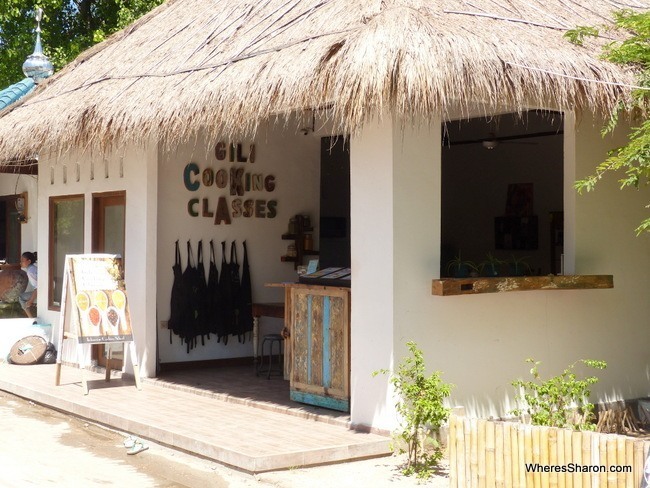 I read many articles online before our visit which talk about this cooking school being on Gili Trawangan. The school there has shut. 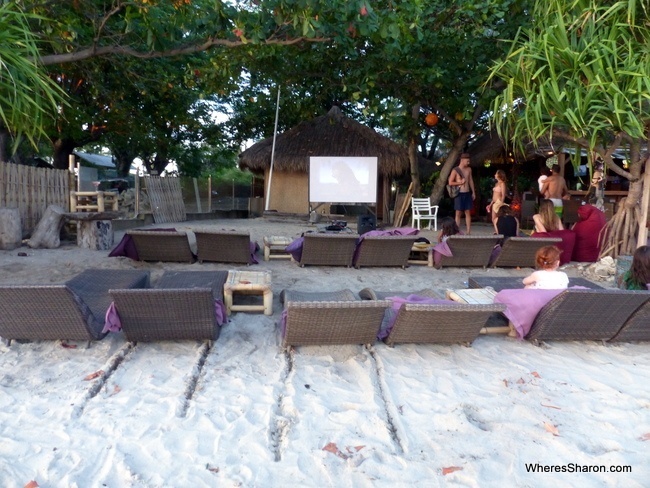 For a relaxing evening, head to the Beach Club on Gili Air to watch a latest release movie. While we were there, they had movies on around 6:30pm and 8pm with the 6:30pm one being family friendly. The four of us enjoyed lounging around and watching a movie one evening. These Gili Islands things to do can be done on any of the Gili Islands. 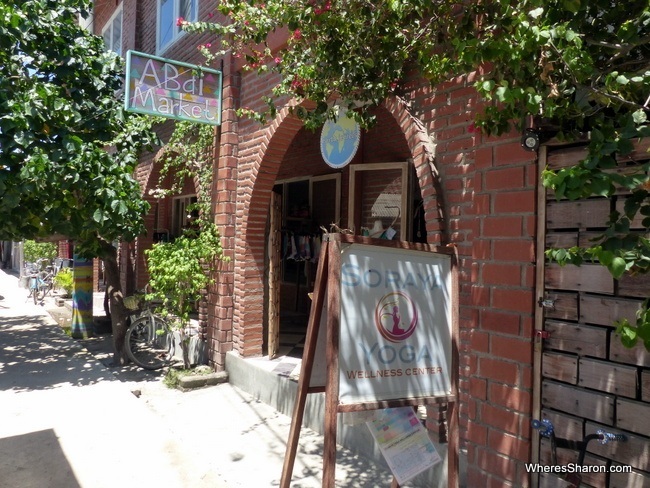 There are lots of yoga centres. There are no shortage of yoga centres and if you want to do it, you won’t have any problems finding one. There are a variety of packages on offer depending on how long you will be around. The Gili Islands are known for their diving and freediving and many people come just for this. 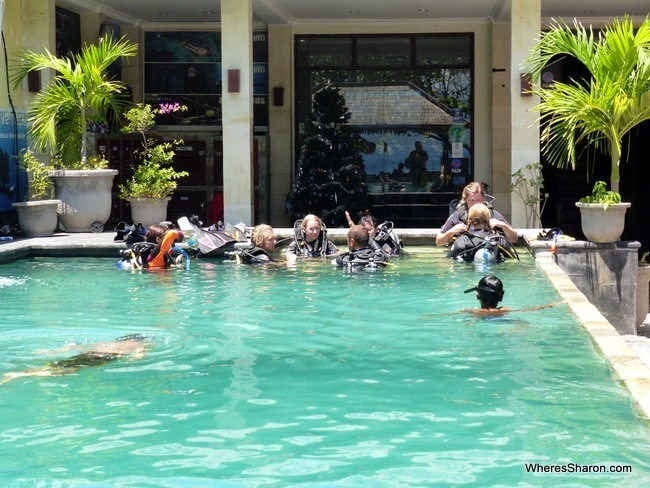 There are dive schools on all the islands (although more on Gili Trawangan) with dive courses at different levels. We saw many advertisements for sunset boat tours and drinking boat trips. There are places everywhere that sell tickets. 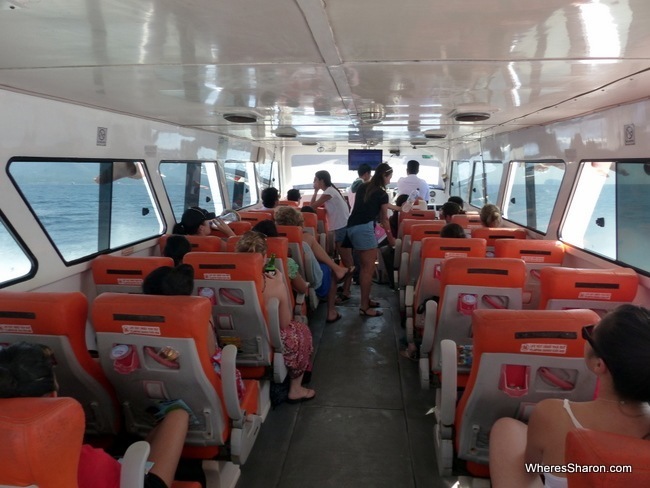 Likewise, there are also many glass bottom boat tours and snorkeling trips. 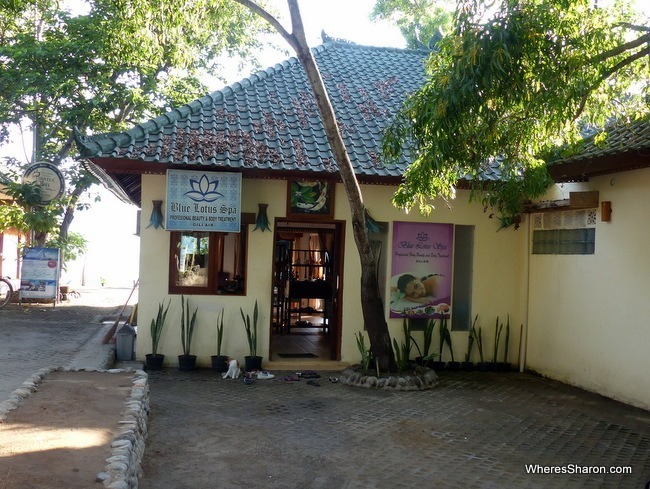 All of the Gili Islands have a good selection of massage places and day spas. These tend to be more expensive and a little classier than most of those found in Bali. Prices are often 120,000 IDR to 150,000 IDR for a simple body massage. I tried one place on Gili Air and the extra money paid off with a pretty good massage. There were no offers of additional “services” too, which is a step up from Bali. Most spas will offer a range of services and packages as well, meaning you can treat yourself with two or three hours of pampering. The nice thing is that these places are often on or close to the beach, so you can get a massage right by the water or to the sound of the waves. Being islands, there is no shortage of beaches and you won’t have to walk far to find somewhere to take a dip. We found the beaches to be generally clean, beautiful and very inviting. I think it would be a shame to go to the Gili Islands and not visit all three of the islands. They all have their own unique flavour and compliment each other well. They are also very close together so it’s only a quick ferry ride. It’s quite easy to island hop through the islands. There are boats throughout the day – you can see more details and the timetable below in the getting around section. It is easy to find places that hire kayaks and there is obviously no shortage of places to use them! We paid 150,000 for an hour. 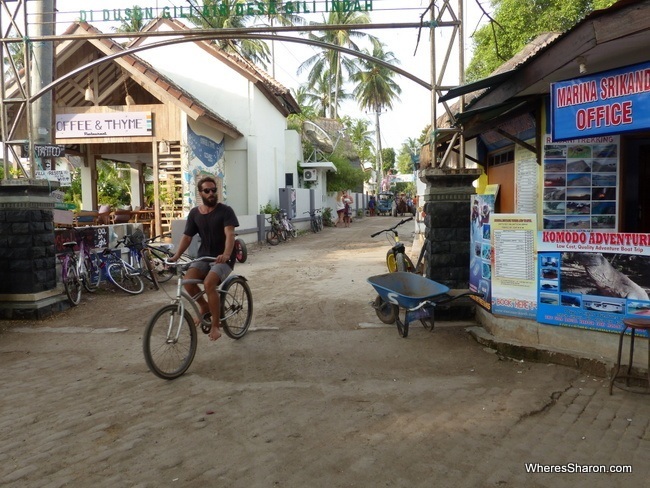 There are lots of bike rental places if you want to cycle around the islands or just use bikes to get around. This is a great option as the only other choice is the cidomo, and they are expensive. There are no cars on these islands. Bikes are not suitable everywhere but the main paths were usually fairly easy to ride on (minor ones can be muddy with rocks). Distances are bigger than they look and it’s hot so this is a good option. We saw one with a kid’s seat as well as kids’ bikes. Make sure you get one with a light if you will be riding in the dark. A cidomo, horse and cart, is the only form of local transport. They are expensive – it took us a couple of days to find one for less than 100,000 rupiah for an equivalent of a ten minute walk! Although you can negotiate the prices, they would not negotiate much and to have any chance of this, you need to get the cidomo rider alone. There is a big question mark over the treatment of the horses, but if you are unable to walk or cycle – like if you arrive with big suitcases – then there aren’t other options. There are places on each of the islands where you can snorkel straight off the beach. There are also plenty of places where you can hire a cheap snorkel. We paid 35,000 rupiah. It’s just a short boat ride to the mainland of Lombok and there are plenty of things to do on this beautiful island – read our full guide here! The first question to answer when working this out is which island to stay on. This really depends on your budget and what you are after. In an ideal world, I would spend awhile and stay on each of them! 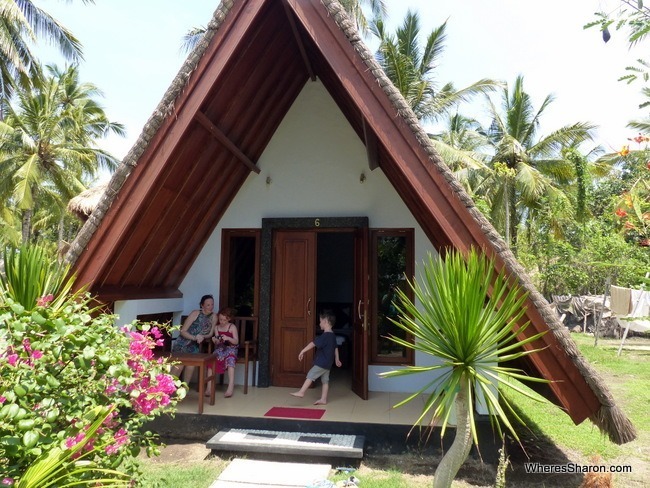 We stayed on Gili Air as it was the right combination of facilities and price for us and it was a good choice. There is plenty around and as much as I like hustle and bustle, all the bars and action on Gili Trawangan might have got to me. We also found it more expensive than staying on Gili Air but there are some fabulous looking resorts. Gili Trawangan does have better access though – we didn’t have to scramble all over boats, through the water and up and down rocks to get in and out of boats here like on the other islands. If I had been any more pregnant (I was 16-17 weeks when we visited), this would have been by far the better choice. If you want to save money then I suggest not visiting when we did – over the Christmas/New Years period. The prices were much higher than other time periods. We stayed in a bungalow at the simple, but beautiful, Lucy’s Garden Hotel, in a very quiet part of the island. It felt like quite a local experience just walking there! It’s only minutes from some nice restaurants on the beach road and about 10 minutes walk from the ferry once you know the best way to get there – we recommend walking left along the beach road to get there until you see a sign telling you to turn off. Then ask anyone you see for directions! Our superior bungalow was simple, small but more than adequate. We got an extra double bed mattress for only an extra 10,000 Rupiah a night. The room had a queen bed, desk, small cupboard and air conditioning. The pool is nice and we pretty much had it to ourselves as there are not many bungalows. The staff are very friendly. Oceans 5 Resort – whether or not you want to dive, this resort is a good option! It’s in a great location near the jetty. There is a great 25 metre pool and a variety of room types – including family bungalows with a king sized bed and an upstairs loft area with up to 4 more single beds. Click here for the latest prices. Sunrise Resort – Gorgeous pool, great rooms with sea views available, by the lovely east coast beach. One kid under 12 stays free. Click here for the latest prices. The Radenz Village – budget option for those on a low budget. Simple but receives great reviews. See the latest prices here. Mahamaya Resort – best option for people who want to get away from it all on Gili Meno and don’t mind paying a bit more. By the beach with a lovely pool. There are two bedroom suites available which would suit a family of up to 6. Click here for the latest prices. Rust Mimpi Manis Bungalows – an okay option if you are on a budget. Convenient location near the jetty with air conditioned and fan only rooms depending on your budget. Family rooms are also available. Click here for the latest prices. 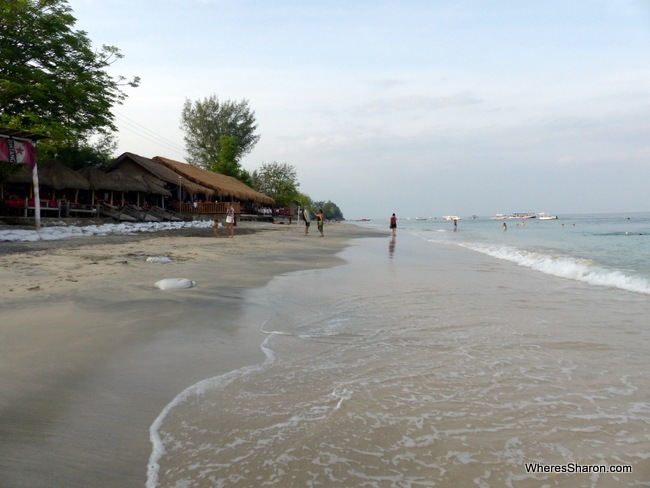 Pearl of Trawangan Resort – beautiful resort located on the main beach path just south of the main action. Beachfront and a variety of room types including two bedroom villas with private pool. Click here for the latest prices. Martas – great mid range option with a beautiful pool area and two story family bungalows. This resort receives outstanding reviews. Click here for the latest prices. Rumah Purnama Hotel – a simple, small hotel for those on a budget. It’s located in a convenient location near to the beach and main jetty. Click here for the latest prices. Find more options for Gili Trawangan here. 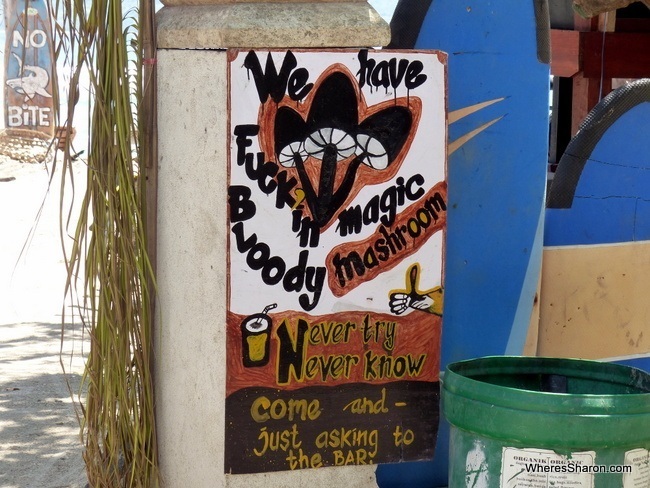 There is no shortage of restaurants on the Gili Islands serving a variety of food. There are some local options but the majority were aimed at tourists and served a mix of local and western good. We didn’t eat anything bad, but it was a step down in quality after Seminyak. 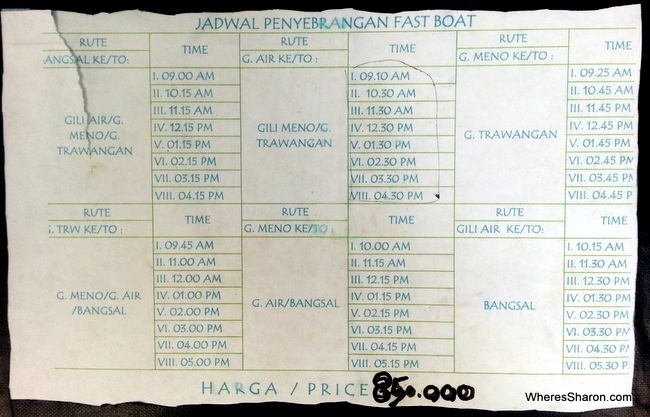 The prices are very reasonable although we did find restaurants a lot pricier on Gili Trawangan than Gili Air. 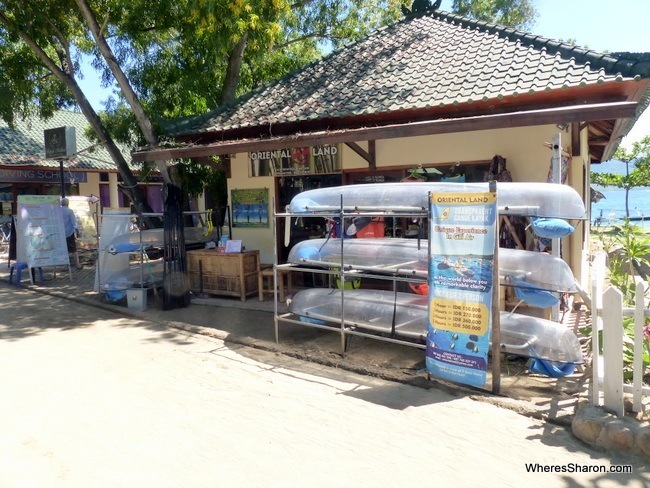 We were able to just walk into random, great looking places on the beach in Gili Air and find plenty of options for 50,000 rupiah or less. 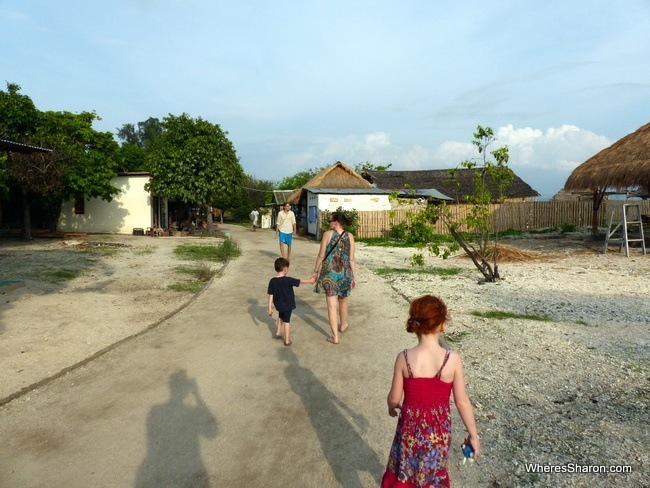 The Gili Islands are a fabulous place to visit with kids. The attractions are all outdoors and there are beaches everywhere for them to play. 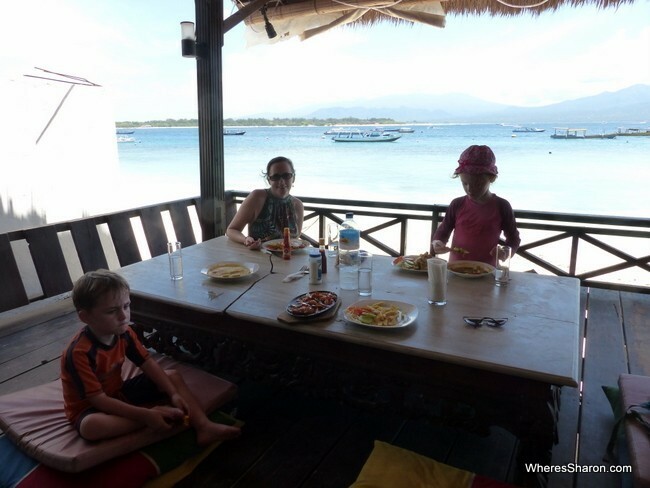 Our kids had a great time on the Gili Islands. 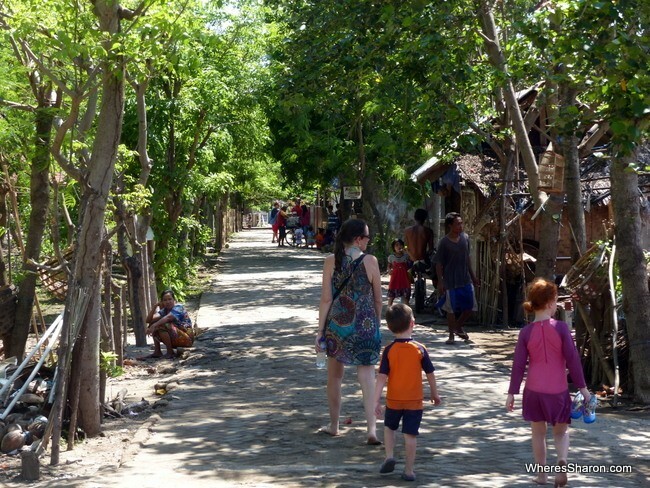 Although we read that Gili Air particularly appealed to families, I think all the islands had their pros and cons. 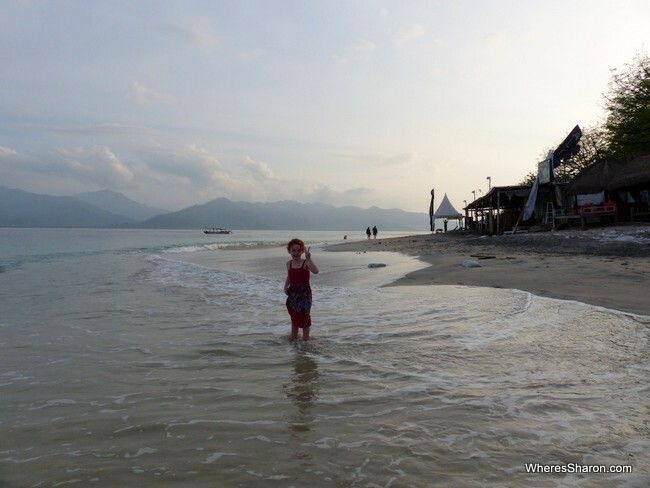 If you have young kids, Gili Trawangan is a bit more accesssible – we didn’t have to climb up coral and walk through the water to get to the shore here! If you do have little kids, definitely try to limit the luggage as getting on and off boats with little kids and luggage is hard work. In some ways Gili Meno interested them most thanks to the turtles and bird park. 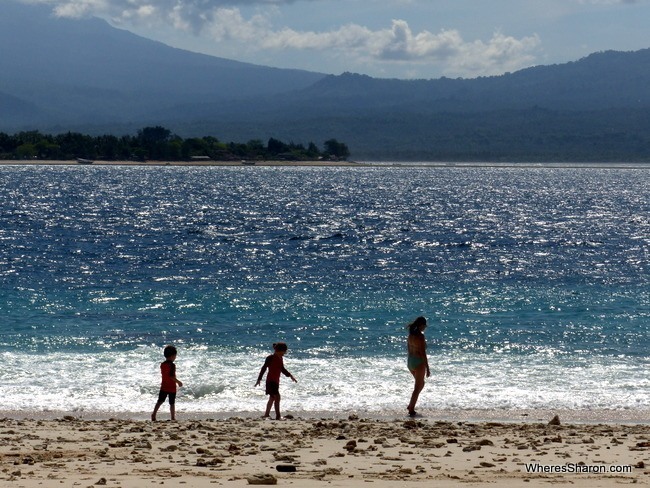 I was four months pregnant on our trip to the Gili Islands and if you want to explore different islands, I’d personally not want to be much more pregnant. The climbing in and out of boats and up coral was hard enough as it was. If you just stick to Gili Trawangan, this would limit this though. We caught the Gili Gili fast boat from Bali to Gili Air. None of the fast boats are cheap but this was the best deal. 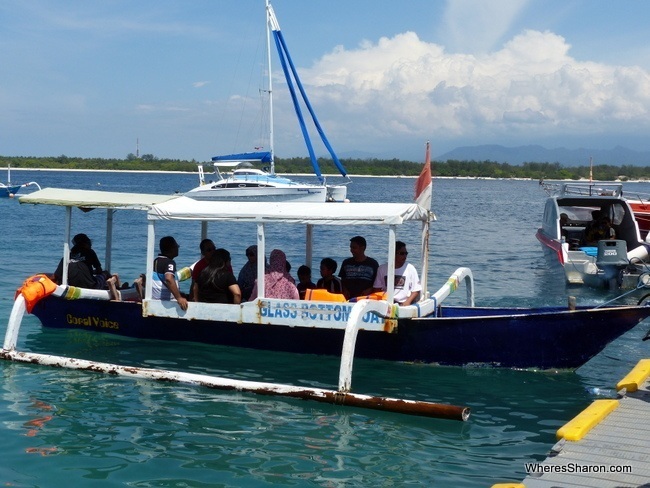 We were picked up in Seminyak, taken to the boat in Padangbai and then had the fast boat ride to Gili Air. We left Seminyak about 7:30am, had a 40 minute wait at Padangbai and made it to Gili Air about 11:40am. The whole process was very smooth including the boat ride itself. It was comfortable and easy and we were even given cold wash clothes, water and cake. We sat inside, but some people chose to sit on top. I was a bit worried when we came into Gili Air and we had to walk along the side of the ship to get off and then down a ladder, but the staff helped the kids and it was no problem at all getting them off. I was so worried about this after reading reports of many aggressive touts in Bangsal, but we did not find this to be the case at all. There are many options between the Gilis and Lombok – you can charter your own boat, take a fast boat or take a local boat. 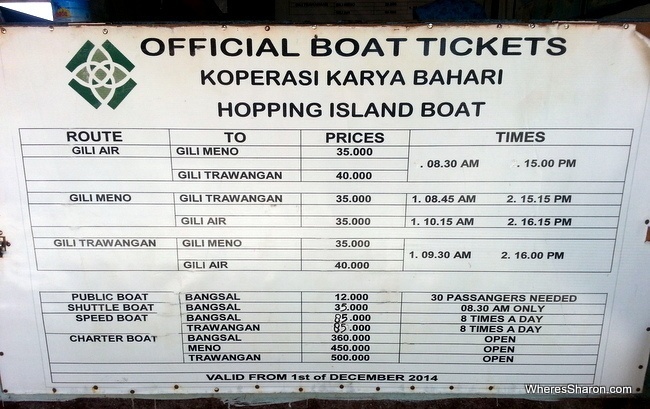 The local boat is substantially cheaper (12,000 rupiah compared to 85,000. Kids half price on both) and just fine. It only takes 20 minutes and we are glad we went with this option. The local boats leave when full which is 35 people. We just missed one but only had a 30 minute wait on Gili Air for the next one. 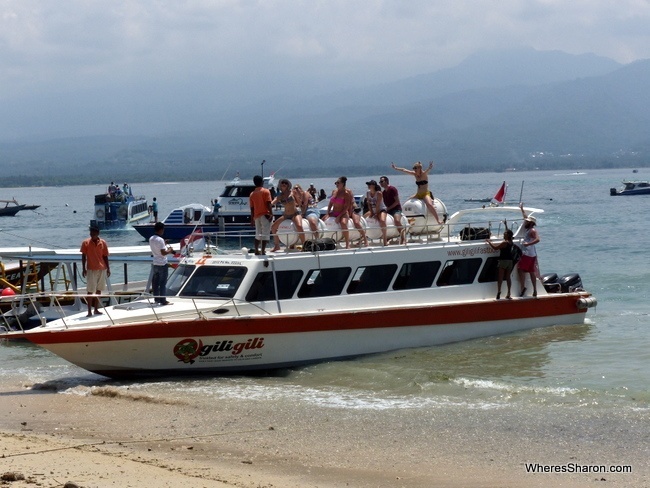 As with many other boats we have taken on the Gili Islands, we had to scramble on and off the boat through the water. We had no problems getting somewhere to sit on board. On arrival at Bangsal, there were plenty of people offering transport, but it only took a “no thank you” for them to leave us alone. Unfortunately, bluebird taxis (the cheapest and most reliable way to travel on Lombok) are not right at the ferry terminal and you need to leave it. This walk was further than we expected – it must be close to a kilometer – and hard going in the heat even with just carry on sized luggage. Basically walk out of the terminal and keep going. At the exit, you will see some white taxis, but just go a bit further to the blue ones. We ended up agreeing to a bemo driver’s offer to give us a private lift to Senggigi for the same price as we were expecting the taxi to cost as the kids were sick of walking. This cost 100,000 rupiah. 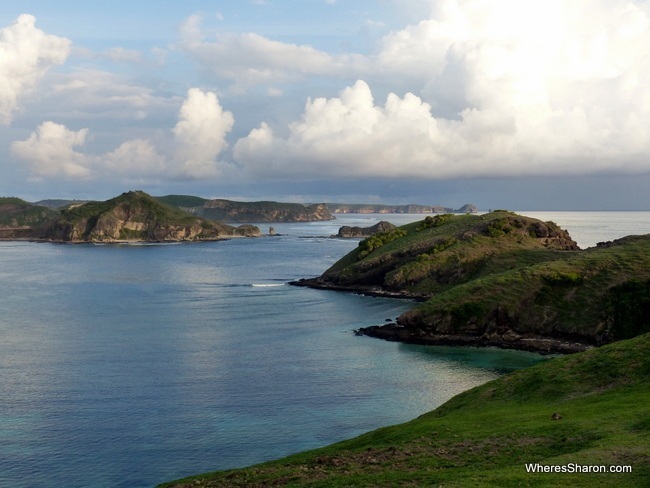 The road to Senggigi is beautiful – with views to the Gili Islands and many coves. But it is winding and J and I both felt ill by the end of it. If you can stand the longer walk to the bluebird taxis this is what we would recommend since we may not have felt so sick had we been able to look out the front window. 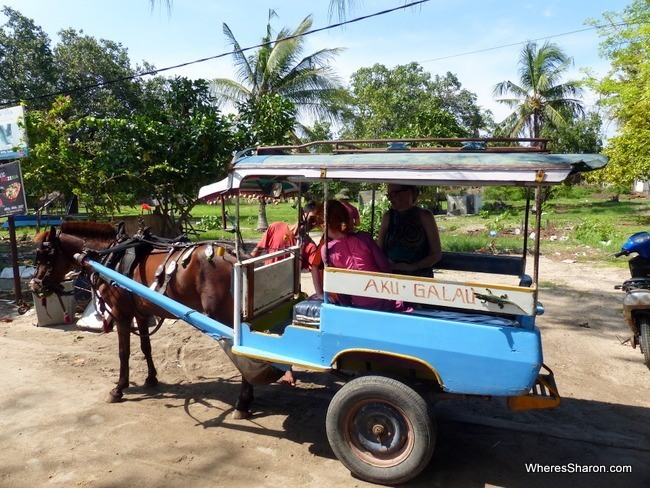 As noted above, there are only cidomos to get around the Gili Islands once you are on them – basically a horse and cart. We found these very overpriced. The other option is to hire bicycles or walk. We walked the vast majority of the time but it is hard work. It’s hot and there’s often no shade on the paths. The distances are also longer than they look on maps. To go between the islands, you need to hop on a boat – there are fast boats and the island hopping boat which is like the local boats. You can also hire a boat but this is obviously more expensive – although may be cost effective if you are in a group. The timetable for both boat options when we visited in December 2015 are above and below as well as the ticket prices. The fast boats are easier and quicker (although not by much) and more likely to pull into an actual jetty so it is easier to get in and out. It is substantially more expensive and it adds up for a family. Kids were half priced on both options. Unfortunately, the island hopper ferry only runs twice a day, so if you don’t want to spend all day on another island, you are stuck with the fast boat. 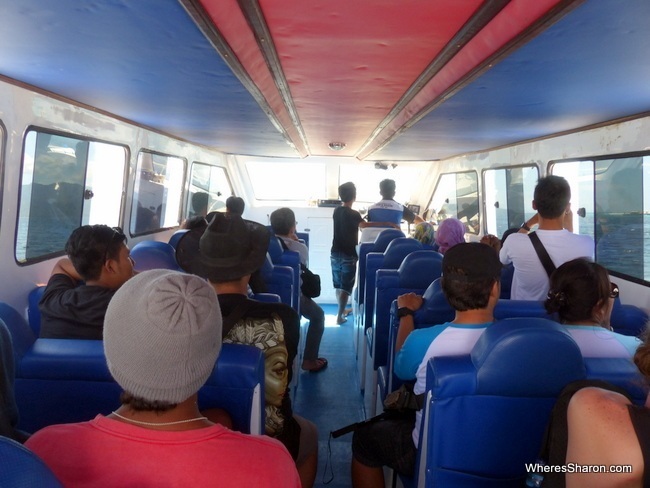 We also found getting a seat on this boat tough – it was full of foreign backpackers who didn’t want to make space for a pregnant woman with young kids. We were on the Gili Islands at the most expensive time of year (between Christmas and New Years) and we averaged about AUD$200 a day. Accommodation at this time was about double the cost of other times of year! We found eating out great meals inexpensive – about $20-30 for 4 people with non alcoholic drinks – our kids eat a lot and order whole meals. It cost more than this on Gili Trawangan. The cost of island hopping added up, but otherwise the attractions were inexpensive. Overall, we found the islands a bargain. Needless to say, we loved our visit to the Gili Islands. It is just so nice, easy and fun! We found it a great mix of people, atmosphere and things to do but not so many that we felt stressed or rushed. I read a lot of cliched stuff before I came here about how this is somewhere that people come for a couple of days and stay a month, etc etc. I hate that sort of statement and it turned me off coming! Now I understand why people say that. It is that type of place. It is not just touristy either. It is surprisingly easy to be walking and suddenly be in a local village. We always had smiles for everyone and I felt very welcome on the Gili Islands. 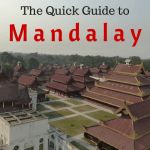 You can also read our guides to Lombok, Bali and other places on Indonesia. 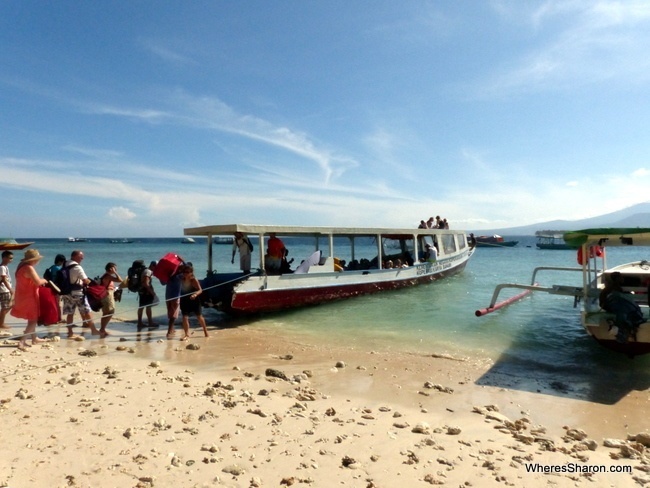 Have you been to the Gili Islands? What did you think? 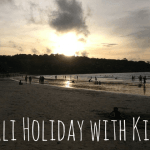 What are your best tips for what to do on the Gili Islands? Hi, I’m glad that you were impressed with the Gili Islands; it was one of my favourite places in Indonesia – though it rained non-stop when I was there! Even so, the sunsets, the snorkelling and the fresh fish made it a great escape from Bali. Thanks for sharing and reminding me of the great time I had there! Great article! Thanks for sharing! I find that the Gili Islands are a wonderful place to visit and to have relaxing days. Intersting, I worked each summer on G.T. for 3 years totalling 6 months. I say this because it was not 3 consecutive years and I watched it go from paradise to a wretched tourist trap. I’m glad you enjoyed yourself, but unfortunately you paid double of what the cost should be and that would be because you were taken advantage due to being a family with young children. The average wage of an Indonesian is $10 per week, a great wage is $20. I am saddened that you were told the turtles care cost that, it simply isn’t true and the owners of the sanctuaries are very wealthy. Also, none of the birds are indigenous to the area and the bird sanctuary is a tourist scam. So when your felt uncomfortable about the cages your intuition was bang on. Your walk through local communities are not authentic. Those families have moved there so their sons and daughters can sell magic mushrooms, launder tourists clothes, and be paid to get drunk with tourists. A place I loved and held dear to my heart (whom I still have many friends who are business owners) has changed and I wanted you and your readers to know that your 3 day review is inaccurate. An American University did a sanitation and sustainability study on the islands and predicted another 7 years. The Gilis have become a piller of corruption and greed masked by a tourist paradise. Average wage of Indonesian is $10 a week? Not sure if you just trolling or just don’t understand anything about Indonesia…. Hi Sharon, did you have any problems on the fast boat from Bali to Gili due to your pregnancy. I see they do not advise you take the fast boat if pregnant. I’m looking forward to our trip in December, your page has loads of good tips. Hi karin – no problems at all, it was quite smooth. The only issue I can see with being pregnant is that there is a bit of climbing involved to get in and out especially if you aren’t going to Gili Trawangan (where there is at least a jetty). I think I was 16 weeks pregnant – I would not have wanted to be much more pregnant because of that. COngrats!! this is probably the longest and intense report we´ve read about the Gili islands. There are so many details! Thank you very much! We just came back from Indonesia and also visited the Gilis. I loved the Gili’s. Such cute little islands. Oooh. This is such a helpful an in-depth guide! I’m visiting Indonesia next month, and am wondering if I should visit the Gili Islands. Your guide is convincing me so! My only concern is my backpack. Does your luggage get wet as your are disembarking the boat? Can you go more in detail about what that’s like? I was able to hold my bag over my head to keep it dry. It can be challenging with kids in tow, but people will usually help a mother in need! AHHH you’re the best! Thanks, Sharon! SO HELPFUL! Thanks so much, Sharon!